A woman stripped Un.clad during a presidential gender based violence summit to the shock of guests at the event. It was gathered that the woman identified as Ausi Phindile decided to strip Nakked at the summit in South Africa to show president Cyril Ramaphosa her scars after she gang [email protected] and underwent five surgeries around her abdomen. 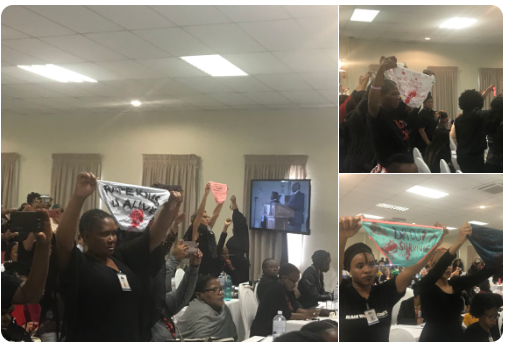 The Gender-Based Violence and Femicide Summit was held on Thursday (yesterday) at Saint George Hotel in Centurion. Government convened the two-day gathering following a call by the total shutdown movement during a march to the Union Buildings on Women’s Day. The summit is aimed at finding ways to address the scourge of femicide and women abuse in the country. Activists have displayed female underwear during Ramaphosa’s address calling for action against gender-based violence perpetrators. The survivors have called for justice and closure, saying some of their abusers are roaming free. Ramaphosa says abuse against women and children can no longer be tolerated in the country.